Brief Synopsis – A former sheriff devotes his life to tracking down the seven men who murdered his wife. My Take on it – This is another film chosen for this series that I knew absolutely nothing about before picking it besides it having an intriguing title. The concept presented here works quite well and hat has a lot to do with the way that they present things as both a revenge story but also a look at a good man wronged in the past who decides to deal with new opportunities afforded in the present while still trying to fix his failures of the past. 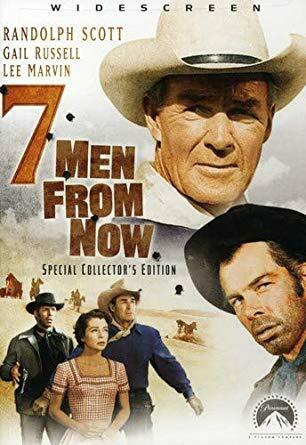 Randolph Scott is perfect in the lead and this film helped show how talented and diverse an actor he could be by carrying this story on his shoulders quite well. The supporting cast also helps hereby throwing a bunch of surprises at us along the way. Lee Marvin stands out among the supporting cast members. Overall, this is quite a solid western that is able to simultaneously work on numerous levels to keep thing entertaining from start to finish. Bottom Line – Very interesting concept that works quite well because it’s both a revenge film and a drama about finding a way to deal with the past even when the present gives someone new opportunities. Scott is great in the lead and proves how talented an actor he can be by carrying this story really well. The supporting cast also works well because they manage to help throw a few surprises into the mix as things move along. This is quite a solid western that works on numerous levels. Recommended!